Asterius is a horse with serious “X factor”. That was something trainer Chris Waller and jockey Brenton Avdulla agreed upon after the three-year-old grey charged from last to lead home a Waller-trained trifecta ahead of Sparky Lad and a brave Gresham. Asterius, coming off a Kembla Grange win first up, relished the speed battle which ensued up front between Radiant Choice, Gresham and Lisdoonvarna, and once that trio had backed off to find their spots the damage was already done. “The plan was to come down the centre of the track but Brenton wisely came through them hence the reason he is the leading rider at the moment,” said Waller. “He won with a bit of class. He has certainly got a bit of x-factor about him and will clear these grades quite easily. It was good to see him do it today as his previous wins have been in easier company. Avdulla has no doubt the son of Sebring out of Group three winner Valentine Miss, who was sluggish into stride, will get over further than 1500m. “He settled out the back and I left him out there, they set a good speed and I tracked up to the back of them. They dropped me around the bend but once I got to about the 250m-300m I could feel him building up underneath me. He was as strong as anything late and I’m sure he’ll get longer,” said Avdulla. Gresham was game in defeat to finish as close as he did, with Punters Intel revealing he was forced into running a slick 11.09s early split from the 1400m to the 1200m to cross from the wide draw. Radiant Choice and Lisdoonvarna finished third last and second last. “It was brave. He got taken on in the run and had to come back but he relaxed well, travelled up well and I thought I was the winner but he was collared late,” said Gresham’s rider Sam Weatherly. 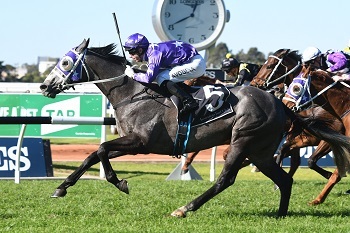 Waller also revealed that it won’t be long before we see the return of another flashy grey in the Star Thoroughbred silks with D’argento a possible starter in the G2 Missile Stakes (1200m) in early August where he would renew his three-year-old rivalry with Kementari and Pierata. “He will be quite forward and we’ll see where he fits in. He could be ready for the Missile as he has got that kind of speed but I wouldn’t be afraid to wait,” said Waller. Check out the results and replays for Rosehill Gardens on Saturday.